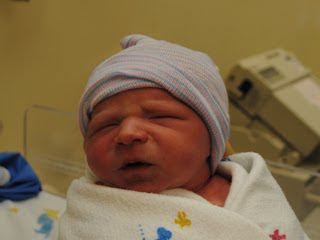 Mattias Linden Cunha was born on Tuesday, September 7, 2010 at 2:27 PM CT at Las Colinas Medical Center in Irving, Texas. He weighed 7 pounds, 11 ounces and was 19 inches long. That translates to 3.48 kilograms and 48.3 centimeters. Congratulations and welcome to the world Mattias! Welcome to BLOGville, sweet boy! You are perfect in every way and we can't wait to get to know you! Congrats Mom, Dad, and BIG SISTER ELISE!!! OH I'm SO happy for you!! Makes me wanna meet my lil girl now! Although I can wait a few more months. ;) Can't wait for more pics!! Completely perfect in EVERY way!! Congratulations awesome family of 4! Congrats! He is a cutie! Remember to enjoy these precious early months even through all the adjustments and stress. . .it goes too quickly! Glad everything worked out with the timing, Elise and grandma, and everyone ready! Congrats to you, Fred and Elise. He is just perfect. Welcome to this wonderful world Mattias - you are a such a lucky boy to be born into such a loving family. God bless little boy. Yes he is beautiful good job fred and joanne and big sister elise . He is precious . Enjoy every minute they grow so fast . Awww, congratulations to Mom, Dad and the big sister! What a BEAUTIFUL baby boy!!! CONGRATULATIONS!!!! He is SO perfect! I love him already! Congrats! He is super cute! I am so glad everything went well! Congratulations! What a sweet little boy! I've been thinking of you ALL all day! He is beautiful! Congrats to you all! Much Love! Welcome to life as a party of four! Congratulations! He's adorable! Big hugs to you and your family during this special time!